Sorry, there are no shows on sale at St Martin's Theatre right now. St Martin's Theatre is a West End theatre, located in West Street, near Charing Cross Road, in the London Borough of Camden. It was designed by W.G.R. Sprague as one of a pair of theatres, with the Ambassadors Theatre. The theatre was Grade II listed by English Heritage in March 1973. This theatre is one of the 40 theatres featured in the 2012 DVD documentary series Great West End Theatres, presented by Donald Sinden. The theatre is currently showing 'The Mousetrap' and has been since March 1974, making it the longest running show in history. 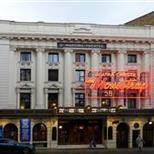 St Martin's Theatre is just around the corner from Leicester Square tube station, served by the Northern and Piccadilly lines. All major London stations connect with the tube. Take the Northern or Piccadily line to Leicester Square station. The venue is in central London so public transport is advised where possible. If you have to drive, you can use MasterPark at Cambridge Circus or NCP at Upper St Martin's Lane and Bedfordbury. There are 3 steps up from the entrance to the Foyer, 3 steps to the back of the Dress Circle, 29 steps down to the front of the Stalls. There is one space available for wheelchair/scooter users in Box C in the Dress Circle. The venue can provide a transfer to aisle seats if available. Induction loop and Infra-red system are available at the venue Box Office. A deposit is required. Guide dogs are allowed in the auditorium or staff can dog sit. For any special requirements and disabled bookings, please call the venue directly on 020 7836 1443.